Have you ever wanted to keep a watchful eye over your home from almost any location in the world? It might sound like a fanciful notion, but with a rich choice of Home Security Apps now available for a free, easy download, it has become a reality. It almost seems too good to be true that we can watch over our homes from a mobile device while we’re on the other side of the world, and yet, this is where modern Technology has taken us. Following Infographic has been developed by JMC Technologies, which is an excellent beginner’s guide to some of the home security apps that will allow you to watch over your property and will cost you absolutely nothing to download. Amongst the 10 apps that come recommended by this online CCTV retailer is iVideon, a reliable, user-friendly app with a very high average customer rating of 4.5 out of 5. Mind you, it’s not hard to see why it is rated so highly when it enables you to connect instantly to your security system, view live footage over an Internet connection, save all data on cloud storage and easily add multiple cameras. The other apps mentioned in the infographic also have their own set of distinct features that make them well worth installing on your Mobile device. These include alerts and instant notifications when unusual activity is detected, the ability to control the locking of your home’s entry points, access a full event history, pan/tilt/zoom of your CCTV cameras and the ability to schedule recordings. One app even provides the capability of communicating with people and pets at home using a built-in microphone and speaker. Now how’s that for keeping tabs on things at home while you’re off in a foreign country for a few days? If somebody told you that you can keep a close watch over the safety of your property simply by taking a quick look on your mobile device, and that you wouldn’t even have to part with any money to do so, wouldn’t you be tempted to take the opportunity? While constantly checking your smartphone or tablet to see if everything’s OK at home might not be your idea of a perfect holiday, it’s hard to imagine many homeowners turning down the chance of such a convenient way of quickly obtaining peace of mind. 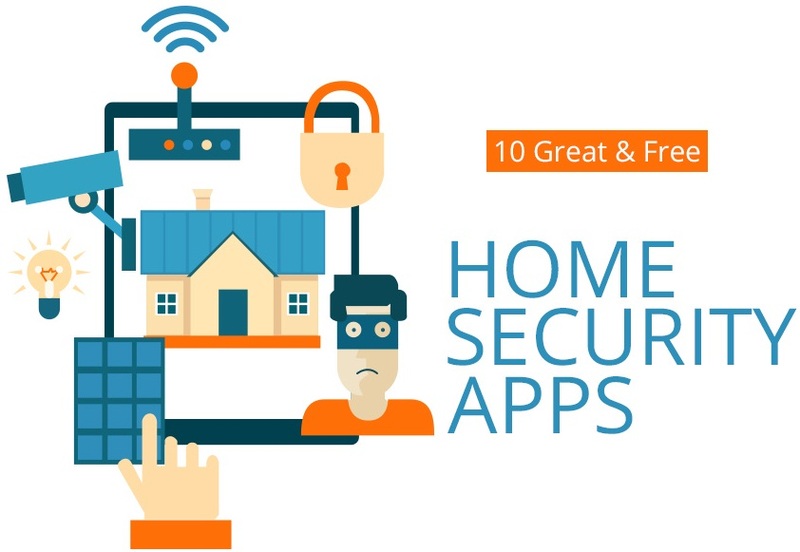 Check out the detailed Infographic on Top Ten Best Free Home Security Apps for Android and iOS Devices with Review, that could put a lot of your worries to bed.